Amy from Buffalo Roam created brilliant (pun!) custom pendant lights with her man for their kitchen. 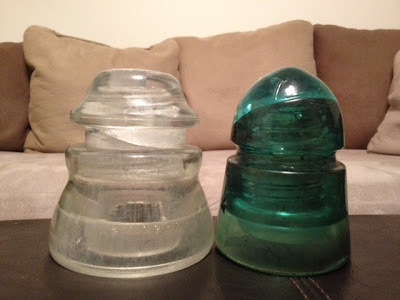 Click the picture below to see how they turned old glass insulators into something more than just pretty. Amy got the name of her blog, Buffalo Roam, from the song "Home on the Range" - she's a Kansas girl! . Her and her husband have both owned and sold several houses, but once they settled down and decided to start a family, they began to dream of their forever home. She started her blog to document building her rustic dream, and she mixes it up with a little DIY, recipes, and even mommy posts.You can catch up with Amy and her goings-ons all over the web. Shannon from Bungalow960 lives in a lovely American bungalow that was built in 1924. The floors in this room (and throughout the whole house) are to die for. 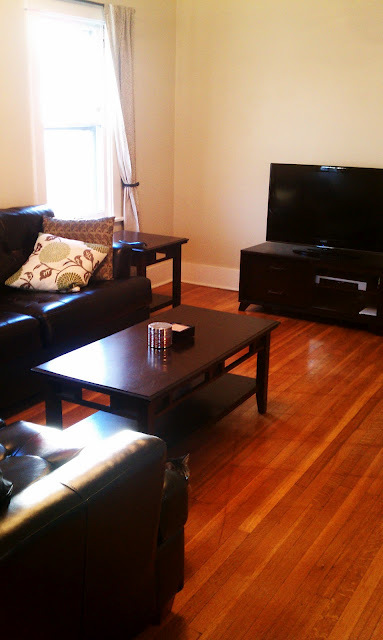 Click on the picture below to visit Bungalow 960 and see more.